Owl Boy is a really cool platformer that I ended up putting down. 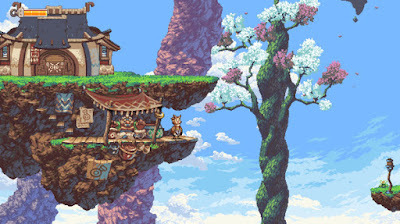 I mean... it's gorgeous, it sounds great, the music is fantastic, you fly but it still manages to be a platformer, and all around it's a really cool take on platforming games. But, it gets really hard. I think I got decently far into it but I finally ran into a wall where I just kept getting destroyed. I'm generally a good platformer player too, so it was surprising to find how frustrated I got with this. I don't mind putting it effort when I feel like I'm learning how to play and slowly getting closer to my goal but some of the difficulty in Owl Boy is a huge spike that seems way too hard to overcome. So, I set this one down. If I ever want a super difficult platformer I might come back to this, but not in the foreseeable future. But, I do love a lot of what the developer has done here so I'd love to see what they do with their next game.